WAI provides a vast array of programs for women in the industry, but it also serves a symbolic purpose. The conference shows the next generation female aviators, engineers and technicians and business leaders what they can accomplish by following their dreams. Girls in Aviation Day is dedicated to that mission. It offers girls between the ages of 10 and 17 the opportunity to meet role models, design airports, use tools, fly simulators and much more. This is the perfect chance to help a girl in your life experience the industry first-hand. Silent actions are a common fundraiser at conferences, but the WAI silent auction is one of the most important. 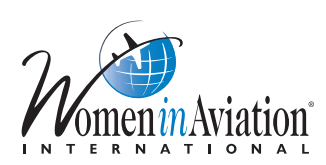 Proceeds from the event support the WAI Endowment Fund, which provides scholarships to deserving young women who wish to pursue a career in aviation. Many incredible items have already been donated this year. You can find a full list here. WAI 2015 isn’t all about business. The annual Hangar Dance gives attendees a chance to relax and boogie down to music from the one-and-only Women in Aviation International Jazz With Wings Band. The band members hail from across the US. It’s a blast when they finally get together after months of solo practice. Any party where the band is having fun is sure to rock for everyone else. This event is not to be missed! Maj. Heather Penney was one of the F-16 pilots dispatched to intercept United flight 93 on Sept. 11, 2001. Her team was scrambled so urgently that they could not pause to equip live ammunition. She accepted the mission even though she knew it might mean ramming the hijacked 757, a maneuver that would likely mean death. But, unlike the other pilots, Maj. Penney also had a personal connection to the flight. Her father was a United pilot operating out of the east coast. She had no way to know whether he was flying United 93. Her tale of courage and duty in the face of incredible adversity will undoubtedly be the highlight of WAI 2015. Induction into The International Women in Aviation Pioneer Hall of Fame recognizes a lifetime of contributions to women in aviation. This years inductees are Priscilla Blum, Phoebe Omlie and Deanie and Nancy Parrish. Blum co-founded the Corporate Angel Network (CAN) which arranges free travel for cancer patients in open seats on corporate aircraft. Omlie was the first American woman to earn a Commercial Pilot’s License and later became a celebrated air racer and aerobatic performer. Deanie and Nancy Parrish are lifelong volunteers who recorded the history of America’s Women Airforce Service Pilots (WASP) through books, recordings, exhibits and more. All of these women are a testament to the incredible contributions of women to the past, present and future of aviation.